The phrase "Chinatown has been ignored since 9/11" has been repeated like a mantra by neighborhood advocates for the last three and a half years, but the governor and mayor made strides to silencing the criticism Wednesday by releasing a spending outline for the rest of the 9/11 rebuilding money. "It's much better than what I thought it might be," Margaret Fung, executive director of the Asian American Legal Defense and Education Fund, said of the 800 million spending plan for the Lower Manhattan Development Corporation's remaining money. Fung, who has been critical of the L.MD.C. spending policies, said she was pleased to see 32 million targeted for Chinatown and a "long overdue" plan to spend 50 million to preserve and build affordable housing Downtown, two years after the money was set aside. Councilmember Alan Gerson in the past has called the L.M.D.C. undemocratic, but he said that the state-city agency's plan includes many items that he and other Downtown groups and advocates have favored. "This is a step forward, but far from a final step," Gerson said immediately after the announcement at the Golden Unicorn restaurant in Chinatown. "The community registered its voice and the community was heard today - but the devil is in the details." The bulk of the money that had not yet been pegged to a program will go to improvements in Chinatown and in the areas around Fulton and Greenwich Sts. Gov. George Pataki announced two weeks ago that 300 million of the L.M.D.C. money would go to the World Trade Center memorial, 150 million to the East River waterfront and 70 million to the Hudson River Park. 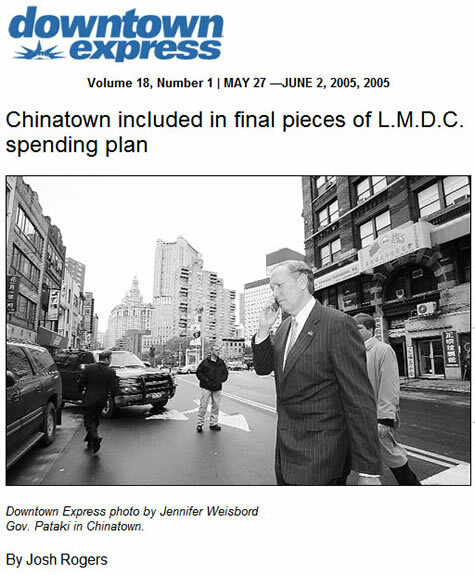 Pataki said Wednesday that Chinatown suffered economically because of 9/11. "This tremendous Mecca for tourists was devastated by the aftermath of the attack," the governor said. After 9/11, police closed off part of Park Row to protect its headquarters, but the closure also blocked the main connection between Chinatown and the rest of Lower Manhattan. Fung, Gerson and others filed lawsuits against the city to reopen the street. The litigation is still pending, but Mayor Mike Bloomberg allowed buses to return to the street two weeks ago. The development corporation money will allow for a pedestrian ramp along Park Row and traffic changes to alleviate the impact of closing the street. "We're confident that this will bring more shoppers, tourists and lunchtime visitors back to the Golden Unicorn and other Chinatown shops and restaurants," Bloomberg said. The plan also includes 7 million for the newly-created Chinatown Partnership Local Development Corporation to tackle the neighborhood's long-standing sanitation problems. Amy Chin, interim director of the Chinatown L.D.C., said this will finally give the neighborhood the wherewithal to solve the garbage problem. "There are a lot of people blaming the victim, but you can't blame the victim if you don't give us the resources to take care of the problem," Chin said. In the Greenwich Street South area near the W.T.C. site, the plan is to build a deck over the entrance to the Brooklyn-Battery Tunnel in order to make it easier for pedestrians to navigate the car-centered area; and to create room for a park and a parking garage for buses. The L.M.D.C. would spend 40 million toward the garage, and an additional 40 million would come out of 9/11-related transportation money. Initial cost estimates for the garage are 125 million and the balance could come from the Metropolitan Transportation Authority or the Battery Park City Authority. The Greenwich Street South plan also includes buying property in the area owned by the M.T.A. in order to create five residential sites with up to 2,700 apartments. The development would be needed to pay for the park and other improvements. Negotiations with the transportation authority are still in the preliminary stage and the outcome will determine the extent to which the Greenwich St. plan is realized. "It's all going to be a function of the deal with the M.T.A.," Dep. Mayor Dan Doctoroff told Downtown Express. "That's the big variable." Doctoroff worked out the details of the L.M.D.C. spending plan with John Cahill, the man Pataki appointed to supervise all Lower Manhattan plans. The governor and mayor share control of the L.M.D.C. On Fulton St., the plan is to upgrade the retail along the street with government incentives and expand the Delury Triangle Plaza near Southbridge Towers. Paul Hovitz, a former member of the Southbridge board of directors, said the Delury proposal would not only improve plaza space, but it would also make it safer to walk since it includes closing off a service area. He said it is too early to know if the Southbridge board and residents will back a proposal to expand the Burger King - Footlocker retail space it owns in an effort to get a more desirable tenant, such as a large bookstore. "I like the idea of bringing back a historical feel to Fulton St.," Hovitz said about the rest of the plan. The 50 million in affordable housing money - first announced by Pataki and Bloomberg in 2003 - will be used to build 200 new affordable apartments and help preserve or renovate 3,000 below-market units. Originally the money was going to go to build 300 new apartments in Tribeca at a development lot known as Site 5B. Doctoroff said after the announcement two years ago, it took awhile to acknowledge the money could be better used to preserve more housing. "We are not afraid to admit when we are wrong," he said. Some new affordable units will be created in vacant second-floor units along Fulton St., Doctoroff said. Shaun Donovan, commissioner of the city Dept. of Housing Preservation and Development, said some of the money will be used for capital improvements to Knickerbocker Village and Masaryk Houses on the Lower East Side in exchange for the complexes agreeing to continue the Mitchell-Lama rent protections. He said the money will also be used to help community groups buy buildings in Chinatown and the Lower East Side and create new affordable units. The city will present the housing plan at the June L.M.D.C. meeting. Pataki and Bloomberg have also agreed to set aside 45 million for Downtown cultural programs and facilities away from the W.T.C. site and 45 million for community enhancement projects. Stefan Pryor, L.M.D.C. president, said the agency is working on guidelines for allocating money for these two funds and there will be more extensive public outreach before decisions are made on this money.